A puppy had an incredible escape after falling from its owners' car on a motorway. 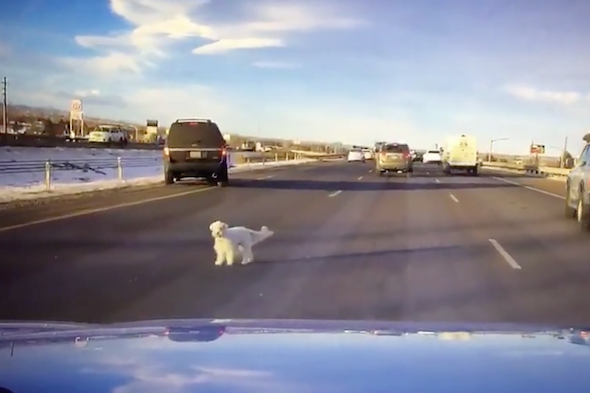 The young Bichon Frise was caught on Erica and Mike Kannely's dashcam as it jumped from the back window of the SUV on Interstate 70 in Arvada, Colorado, on Tuesday. The puppy rolled several times before jumping to its feet in front of their vehicle, which they had thankfully managed to bring to a halt. It stood bewildered in the centre of the road holding its front left paw aloft while a man got out of the vehicle from which it had fallen and came to pick it up. Mrs Kannely shared the footage with the Daily Mail, commenting: "We want to spread the word to be careful with dogs. Poor guy! "Thank God there was traffic so they weren't going too fast! I am so guilty of letting my dogs look out the windows while I drive. But NEVER again!"